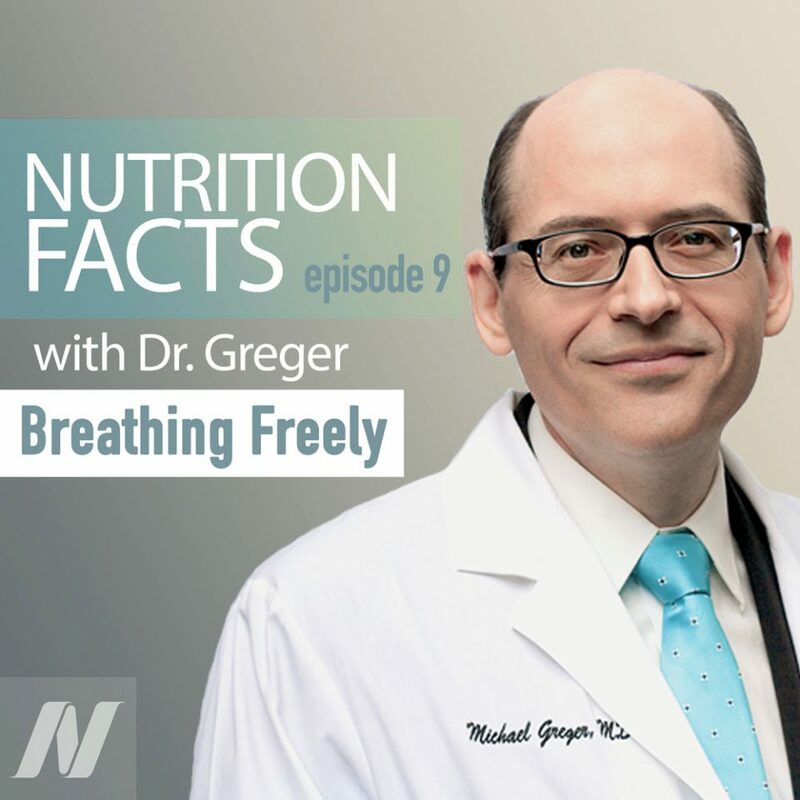 In this episode we learn about the best way to have healthy lungs with new information about asthma rates and fruit and vegetable consumption, lessening the effects of COPD, and the latest research about the effects of air freshener products. This episode includes audio from Preventing Asthma with Fruits and Vegetables, Throw Household Products off the Scent, and Treating COPD With Diet. Hello and welcome to Nutrition Facts – the podcast that brings you the latest in evidence-based nutrition research. I’m your host Dr. Michael Greger. I’m often asked what my opinion is about one food or another. I know what people are asking but, you know, I’m not interested in opinions. I’m not interested in beliefs. I’m interested in the science. What does the best available balance of evidence published in the peer-reviewed medical literature show right now? That’s why I wrote my book, “How Not to Die”, and why I created my nonprofit site NutritionFacts.org and, now, this podcast. Today, we’re going to talk about lung health, starting with asthma. A recent study involving more than a million kids suggests the striking worldwide variation in childhood rates of allergies, asthma, and eczema may be related to diet. Asthma is the most common chronic disease in children and the prevalence is increasing around the world. Despite this, most research dollars are spent on adult chronic diseases. One might ask whether this is because our politicians and senior administrators feel themselves to be more likely to suffer from the latter and ignore allergic diseases because they have their major impact on children and young adults who don’t vote. Imagine how much more effort would be put into elucidating causes of a disorder that increased at the same accelerated rate in the middle-aged and elderly. Well, finally, an international study of asthma and allergies in childhood, studying more than a million children in nearly a hundred countries, making it the most comprehensive survey of these diseases ever undertaken. What did they find? They found a wide variability in the prevalence and severity of asthma, allergies, and eczema. We’re talking a 20-fold to 60-fold difference in prevalence of symptoms of asthma, allergic runny nose, and atopic eczema around the world. Striking worldwide variations in the prevalence of allergic symptoms. What does it all mean? Well, the large variability suggests a crucial role of some kind of local characteristics determining the differences in prevalence between one place and another. What kind of environmental factors? Like, why does the prevalence of itchy eyes and runny nose range anywhere from 1% in India, for example, up to 45% of kids elsewhere? There were some associations with regional air pollution and smoking rates, but the most significant associations were with diet. Adolescents showed a consistent pattern of decreases in symptoms of wheeze (current and severe), allergic rhinoconjunctivitis and atopic eczema, associated with increased consumption of plants. The more their calories and protein came from plant sources, the less allergies they seemed to have. In general, there seems to be an association between an increase in asthma prevalence and a decreased consumption of fresh fruits, green vegetables, and other dietary sources of antioxidants, helping to explain why the prevalence of asthma and respiratory symptoms is lower in populations with high intake of foods of plant origin. Intakes of high fat and sodium, and low fiber and carbohydrates, are linked with asthma, while traditional vegetarian diets are associated with lower rates. For example, if you look closer within India, in a study of more than 100,000 people, those who consumed meat, for example, daily or even occasionally, were more likely to report asthma than those who were strictly vegetarian, which meant also avoiding eggs. Eggs have been associated, along with soda, with an increased risk of respiratory symptoms and asthma in schoolchildren, whereas consumptions of soy foods and fruits were associated with reduced risk of respiratory symptoms. In fact, removing eggs from the diet, along with dairy, may improve lung function in asthmatic children in as little as eight weeks. So, maybe it’s a combination of eating less animal foods and more plants. High vegetable intake, for example, has been found protective in children, cutting the odds of allergic asthma in half and fruit showed a consistent protective association for current and severe wheeze and runny nose in adolescents and for current and severe asthma, allergies, and eczema for children. But why? I’ve talked about the endocrine-disrupting industrial pollutants building up in the meat supply that may increase the risk of allergic diseases, but the increase in asthma may be a combination of both–a more toxic environment and a more susceptible population. The dietary changes which have occurred over recent years may have led to a reduction in these natural antioxidant defenses, resulting in a shift of the antioxidant status of the whole population and leading to increased susceptibility to oxidant attack and airway inflammation. In adults, for example, the risk of airway hyperreactivity may increase seven-fold among those with the lowest intake of vitamin C from plants foods, while the lowest intake of saturated fats gave a 10-fold protection, presumably because saturated fats have a role in triggering inflammation. The protective effect of plant food may also be mediated through effects on intestinal microflora. It turns out that differences in the indigenous intestinal flora might affect the development and priming of the immune system in early childhood. Kids with allergies, for example, tend to be less likely to harbor lactobacilli, the good bacteria that’s found in fermented foods and also just naturally on fruits and vegetables and Lactobacillus probiotics may actually help with childhood asthma, which may help explain why children raised on largely organic vegetarian diets may have lower prevalence of allergic reactions. Infants raised in this way tend to have more good lactobacilli in their guts compared to controls, though they were also more likely to have been born naturally, breastfed longer, and not given as many antibiotics. So, you can’t really tell whether it’s the diet until you put it to the test and here’s more about how diet is related to asthma prevention. It appears that increasing fruit and vegetable consumption to seven servings a day may cut asthma rates in half, whereas restricting consumption to the standard American diet, leads to a significant worsening of lung function and asthma control. Here’s the story. In the international study of asthma and allergies in childhood of over a million kids, a consistent inverse relationship (meaning protective relationship) was seen between prevalence rates of asthma, allergies, and eczema, and the intake of plants, starch, grains, and vegetables. If these findings could be generalized, and if the average daily consumption of these foods increased, researchers speculated over a decade ago, an important decrease in symptoms prevalence may be achieved. No need to speculate anymore though, plants were finally put to the test. Researchers had proposed that by eating less and less fruits and vegetables, this had increased the susceptibility of the population as a whole to potentially harmful inhaled substances by reducing the antioxidant defenses within our lungs. That makes sense. The thin lining of fluid that forms the interface between our lung lining and the external environment, is our first line of defense against oxidative damage, which plays an important role in asthma, contributing to airway constriction, contraction, mucus, hypersensitivity. Antioxidants protect against oxidative stress though, so our lung lining contains a range of antioxidants our body makes itself, as well as those obtained from our diet, particularly from fruits and vegetables. In fact, we can even quantify the level of oxidative stress in people by measuring the level of oxidation products in their exhaled breath, which drops as they start eating more fruits and vegetables, then drops further when they combine more plants with less animal foods. So, do those with asthma really have lower levels of antioxidants than people without asthma? Compared to healthy controls, subjects with asthma had lower whole blood levels of total carotenoids, and each of the individual plant phytonutrients they measured: cryptoxanthin, lycopene, lutein, alpha-carotene and beta-carotene, compared to healthy controls. So, the accumulating evidence does suggest that diet has an influence on modulating the response of the lung to inhaled allergens and irritants but, wait a second, it is possible that the reduced carotenoid levels in asthma are a result of increased utilization in the presence of excess free radicals. So, it’s like a chicken-or-the-egg phenomenon or, in cholesterol-free vernacular, which came first, the pea or the pod? We know antioxidant-rich diets have been associated with reduced asthma prevalence; however, direct evidence that altering intake of antioxidant-rich foods actually affects asthma was lacking, until now. There are two ways to test the effects of fruits and vegetables on asthma: Add fruits and vegetables to people’s diets and see if their asthma improves or, like they did here, take asthmatics and remove fruits and vegetables from their diets and see if they get worse. This was the first research group to see if altering the intake of antioxidant-rich foods directly affects asthma outcomes. Placing subjects with asthma on a low-antioxidant diet for just a matter of days led to a significant worsening of lung function and asthma control. This finding is highly significant for subjects with asthma, as it indicates that omitting antioxidant-rich foods from the diet, for even a short time frame, will have a detrimental effect on asthma symptoms. Interestingly, ironically, the low-antioxidant diet consumed by the subjects, where they were restricted to one serving of fruit and only up to two servings of vegetables per day, is typical of Western diets. In other words, the low-antioxidant diet they used to worsen people’s asthma, to cripple their lung function, was just like the standard American diet. As about half the population usually consumes a diet with an intake of fruit and vegetables equivalent to the study diet or less, it appears likely that this dietary pattern, which must be considered suboptimal for lung health, may be having a significant impact on asthma management, indicating the potential for typical Western dietary patterns to contribute to the worsening of lung function and asthma control. Within just days, cutting down fruit and vegetable intake can impair lung function, but does adding fruits and vegetables actually help with asthma? That was the second phase of the study. Asthmatics on the standard American diet in this study had about 40% chance of relapsing into an asthma exacerbation within 3 months, but put them on seven servings of fruits and vegetables, instead of three, and you can cut their exacerbation rate in half, down to 20%–just with a few fruits and vegetables. You know those air freshener products that make you feel like you’ve been transported to a field of daisies? Well, it turns out that many of these products contain volatile chemicals that can make it harder to breathe. In addition to meat, exposure to common household chemicals may exacerbate or induce allergies, asthma, and eczema. Researchers at Harvard and all around the world collected air samples from where children slept and demonstrated for the first time that the bedroom concentration of propylene glycol and glycol ethers was significantly associated with an elevated risk of multiple allergic symptoms, runny nose, and eczema. This class of chemical compounds is found in cleaning fluids, paint, pesticides, PVC pipes, varnishes, and may be one of the reasons we’ve seen an increase in these kinds of diseases around the world over the last few decades. Recently, researchers put a few consumer products to the test–air fresheners, a laundry detergent, fabric softener, dryer sheets–each with annual sales over $100 million. Six products, nearly a hundred volatile chemicals identified, though none were listed on the labels. Usually, it just says something like “fragrance” and ten of the chemicals they found are regulated as toxic or hazardous, with three officially classified as hazardous air pollutants. For example, the fabric softener they tested, on the label, it just says “biodegradable fabric softening agents” and it even smells like mom, when she leans in for a good night kiss. But this is what they really found, including the carcinogenic hazardous air pollutant acetaldehyde. What about if you just stick to the naturally scented products? Even products advertised as green, natural, organic emitted as many hazardous chemicals as standard ones. For example, a soap boasting pure essential oils and organic tea infusions also contained all of these. Yeah, but what if you somehow know for certain it’s all just natural, like the limonene, right? That’s a real phytochemical found in real citrus, until it photo-oxidizes with ozone in ambient air to form dangerous secondary pollutants, including formaldehyde. When it comes to consumer products, the best smell is no smell. Dietary interventions, including increasing fruit and vegetable intake and decreasing meat intake, may not only help slow the progression of chronic obstructive pulmonary disease, but may actually improve lung function. Here’s the story. 120 COPD patients were randomized into two groups. Half were told to boost their fruit and vegetable consumption and the other half stayed on their regular diet. The intervention group was told to eat at least one more serving a day of fruits or vegetables and they did, and they did for three years; more fruit and more vegetables than control. Slowly but surely, they got worse. That’s what happens in COPD (emphysema); you get worse, and worse, then you die. The group told to eat at least one more measly serving of fruits or vegetables every day started out the same, but didn’t get worse. One year, two years, three years. In fact, if anything, it looks like their lung function got a little better. That’s not supposed to happen; you’re supposed to get worse. Could be the antioxidant effect of fruits and vegetables, could be the anti-inflammatory effect or, frankly, it may not directly be the fruits and vegetables at all. When you eat more of one thing, you tend to eat less of another. For example, the addition of fruits and vegetables resulted in a decreased consumption of meat, which is known to be a pro-oxidant. Either way, though, there is now hope. These findings suggest that a dietary shift to higher antioxidant food intake may be associated with improvement in lung function and, in this respect, dietary interventions might be considered in COPD management. The tobacco industry viewed these landmark findings a little differently. Instead of adding fruits and vegetables to one’s diet to treat emphysema, wouldn’t it be simpler to just add them to the cigarettes? And, voilà, the addition of açaí berries to cigarettes evidently had a protective effect against emphysema in smoking mice. Next, they’re going to try to add berries to meat. I can always count on the journal Meat Science. Now, adding fruit extracts to burgers was not without its glitches, though. The blackberries literally dyed burger patties with a distinct purplish color, though infusing lamb carcasses with kiwifruit juice before rigor mortis sets in does evidently improve tenderness and it is possible to improve the nutritional profile of frankfurters with powdered grape seeds, though there were complaints that the grape seed particles were visible in the final product and, if there’s one thing we know about hot dog eaters, it’s that they’re picky about what goes in their food. Thanks for listening to this episode of Nutrition Facts. To see any graphs, charts, graphics, images, or studies mentioned here, please go to the Nutrition Facts podcast landing page. There, you’ll find all the videos I highlighted with links to all the sources cited.